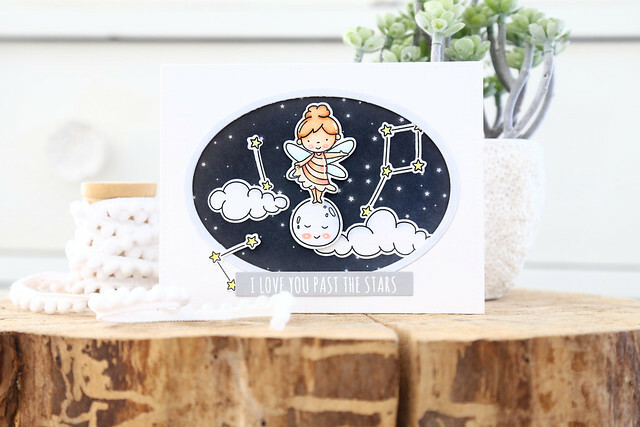 I'm here and on the NT blog this morning, with a sweet friendship card using images from To The Stars, from our newest release. I did the softest ink blended sky using Lawn Fawn's Mermaid ink and an oval makeup brush. Honestly, those brushes make it too easy! It's foolproof. Then, I flicked some white paint onto the sky, to give it a dreamier quality before laying in the clouds and fairies. I gave the girls matching hair colors and outfits, and finished off the card with a sentiment from So Many Sentiments. If you're looking for today's Lawn Fawn post, scroll down or click HERE. I'm pulling double shifts all week! Welcome back to Neat and Tangled's release week! We've shown you all of the new goodies that will be for sale as of tomorrow morning. In the meantime, the design team has created bonus projects for you today! I used To The Stars, and did some moodier ink blending. I used a yellow and a few shades of blue ink. While I was blending, my daughter exclaimed - huh! yellow and blue really do make green! I purposefully left it really light around the moon, so that it looked like a glowing haze. I flecked on some white and also some black ink and added a few clouds and stars to the night sky. The sentiment was nestled in and heat-embossed. I hope you like it! Check out the Neat and Tangled blog for more inspiration - click! 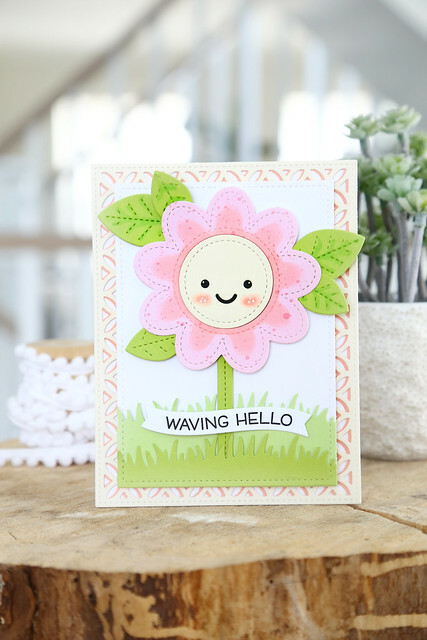 Welcome to Lawn Fawn's April inspiration week! We're taking a closer look at some of the spring collection, and hoping you'll be inspired to get creative yourself! I cut a piece of white cardstock with a wavy Stitched Hillside Border die, and then cut into it again with a larger butterfly die. I then backed the negative space with a speckled pink paper, to set it apart from the scalloped pink paper to the right. I borrowed a sentiment from Butterfly Kisses, and added a heat-embossed butterfly trail as well. I hope you like it! 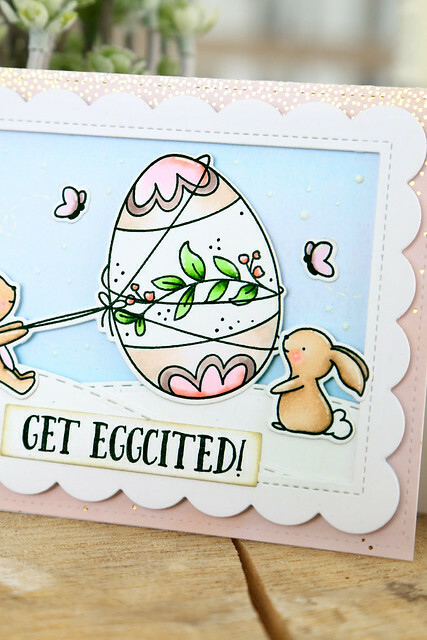 Check out the Lawn Fawn blog today to see this card being made from start to finish in Kelly's video - click! If you're looking for today's Lawn Fawn post, scroll down or click HERE. I'm pulling double posts all week! Welcome back to day 3 of this month's Neat and Tangled release week! 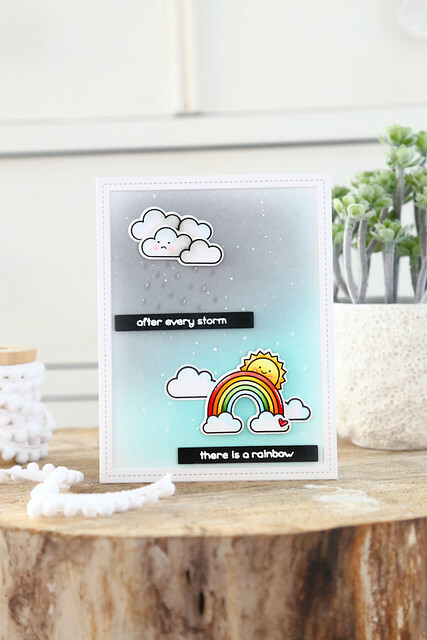 Today, we're showing off an AMAZING background stamp designed by Miriam. Itis a 6x6 cling rubber stamp called Receding Background, and so perfect for both bold and subtle backgrounds. I did some ink blending over the entire cardfront using Lawn Fawn's Ballet Slippers ink. Then, I stamped the Receding Background image on top using the same ink. I love the subtle look this gives! 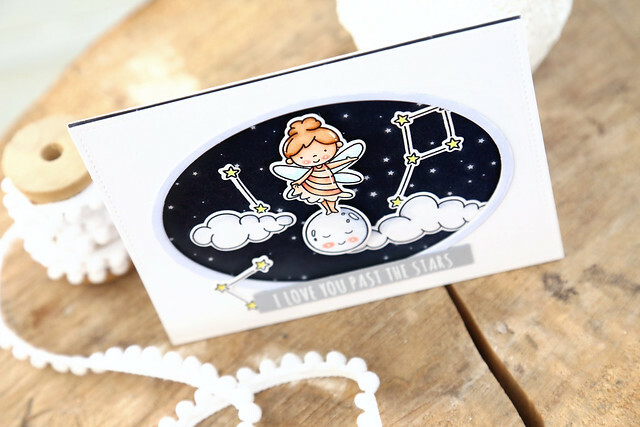 I then stamped a greeting from A-mazing and added the fairy, moon and clouds from To The Stars. 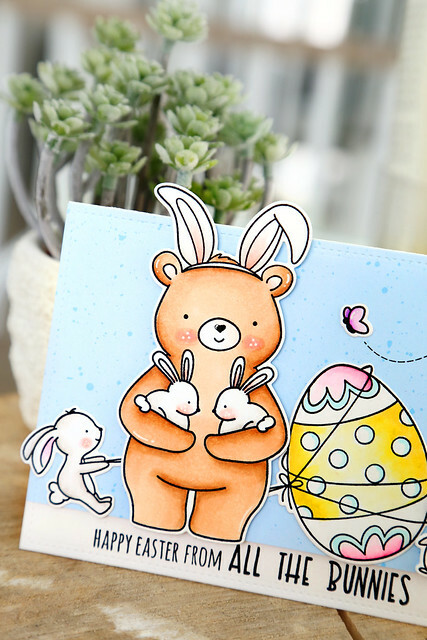 Welcome to Lawn Fawn's April inspiration week. 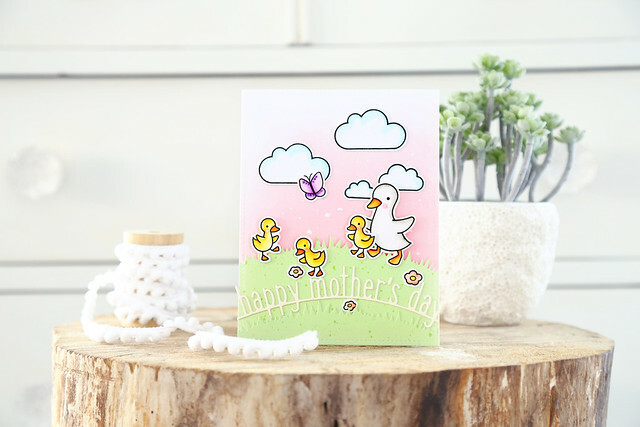 Today is our showcase of the Mother's Day Line Border die. I create a scene of a mommy with her little ducklings, and got the line border to follow the same curve as the grassy hills. The ducks are from Rub-A-Dub-Dub, the clouds, butterfly and flowers are from Butterfly Kisses. I love mixing a little old and new together! I hope you like it! Be sure to check out all the inspiration on the LF blog this morning - click! If you're looking for today's Lawn Fawn post, scroll down or click HERE. I'm pulling double postings all week! Welcome to day 2 of this month's Neat and Tangled release week! Everything we show you this week will be available for purchase as of Friday morning (April 19th). 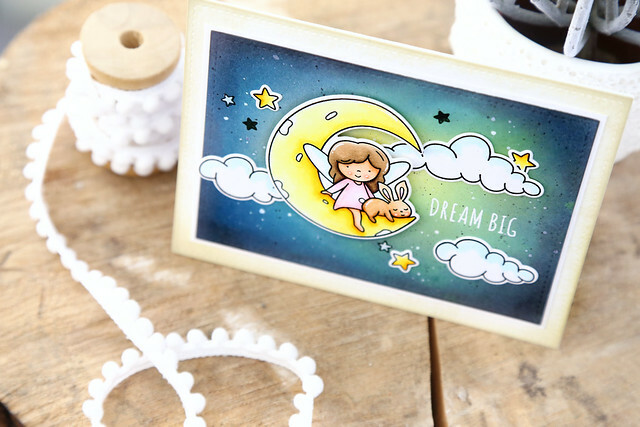 Today, we're showing off a 3x4 stamp set called Dream Big. It features a fairy riding a flying goose, and works so well with the previously shown To The Stars. It's right out of a fairy-tale, isn't it? I created as dreamy a backdrop as I could for the main image, by ink-blending the softest pink haze, and laying a trail of stars beneath the goose. I layered a few of the puffy clouds from To The Stars, and used a white gel pen to add some white dotted accents to the background layer. I hope you like it! Don't forget to leave me a comment before you go! Danielle will choose a random comment from among all of the design team's posts this week - the winner will be awarded a $25 store gift card! And be sure to check out what the rest of the design team did with this set - click! I turned the raindrops upside down - i was thinking they looked more like underwater bubbles that way? I did some ink blending on the raindrops layer, keeping it darker towards the bottom. 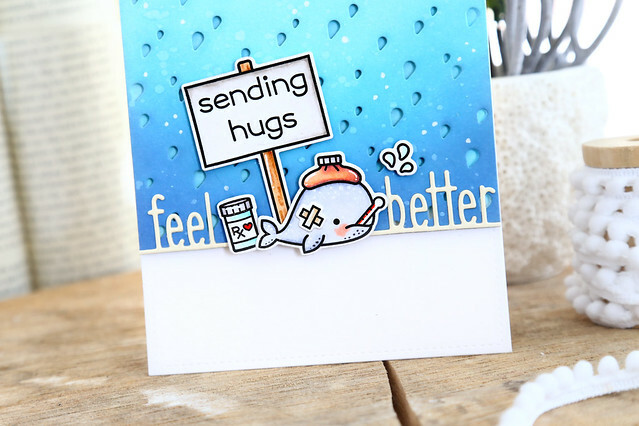 The whale is from Get Well Before 'n Afters, the sending hugs sign is from Open Me, and I finished the design with the Feel Better Line Border. I hope you like it! There's more to see on the Lawn Fawn blog today - click! If you're looking for today's Lawn Fawn post, scroll down or click HERE. I'm pulling double postings for the rest of the week! On day 1, we're showing off a set that I illustrated, called To The Stars. I've been wanting to do a fairy set for a long time, but I've seen enough cute garden fairy sets to steer clear of that kind and go a more celestial route. 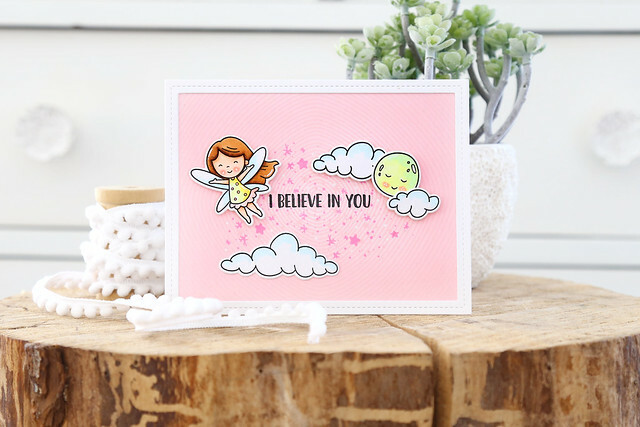 This set features 3 fairies, a few puffy clouds, a constellation and the cutest moon. I perched the daintiest fairy atop the moon, and positioned a few clouds and constellations all around. Using the oval dies from the Card Front Designs die set, I created an aperture to house all of the focal images. I love that by nesting the oval dies together, I could create a thin frame. I love little finishing touches like that! To color the clouds and the moon, I opted for light greys (Copic markers T0, T1) since I used a night-sky patterned paper. You guys, I think this is my last scrap of this paper. I have been hoarding it for so long! I wish I knew who made it and where I could get some more! To get different sizes of constellations, I simply snipped off a star or 2. Easy peasy. In the stamp set, I also included a lone star and a tiny line image - you could create a whole backdrop of unique constellations! I love the sentiment included in the set. Originally, I included the usual "love you to the stars" but my good friend Bethany suggested I go PAST the stars - so magical! I hope you like this new set! Stayed tuned for a smaller, companion set that will debut tomorrow! Be sure to check out the NT blog this morning (click!). GIVEAWAY: before you go, leave me a comment! Danielle will choose a lucky winner from among all of the design team's blogs this week. On Friday morning she will announce the winner of a $25 store gift card. Good luck! 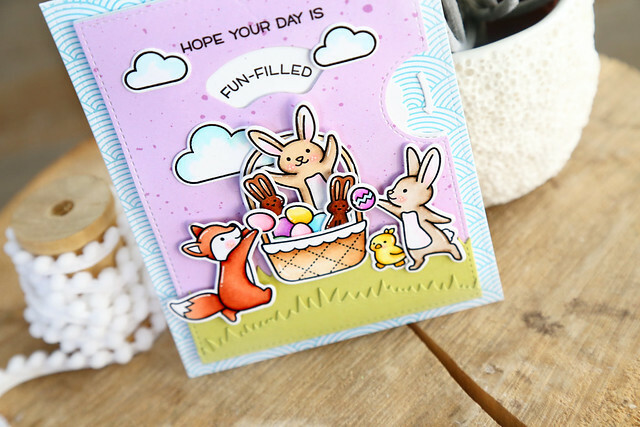 Welcome to Lawn Fawn's April inspiration week. We're taking a closer look at some sets and dies from the spring collection. 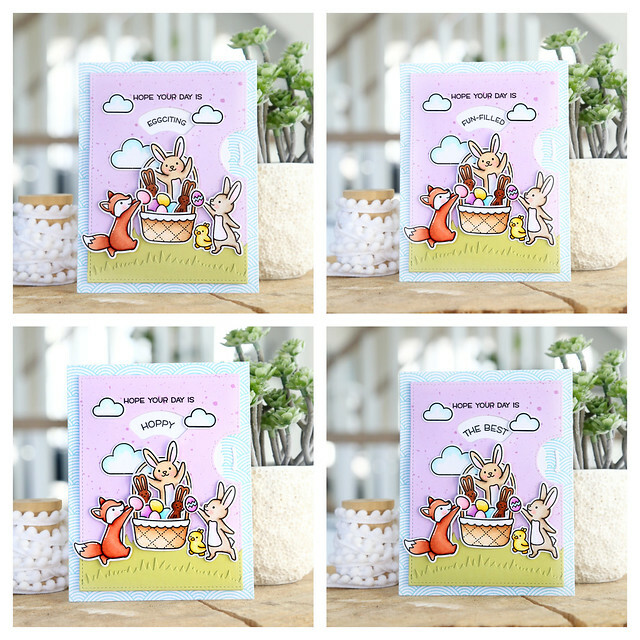 Today, we're showing off Year Nine, Lawn Fawn's 9th birthday set! I colored the taco, put a party hat on him, a candle in front of him and called it a party. 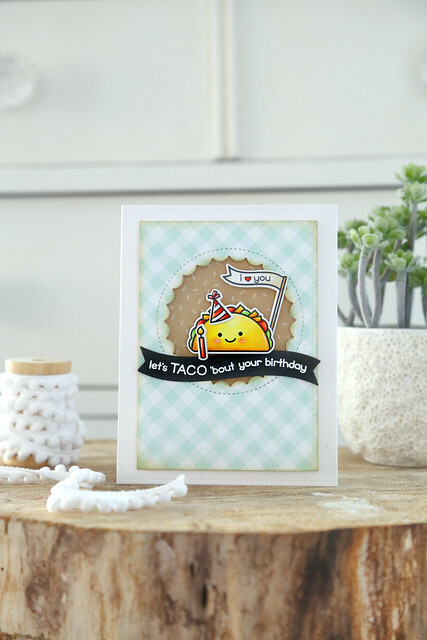 I stamped the confetti image behind the taco, on a layer of kraft-colored cardstock. 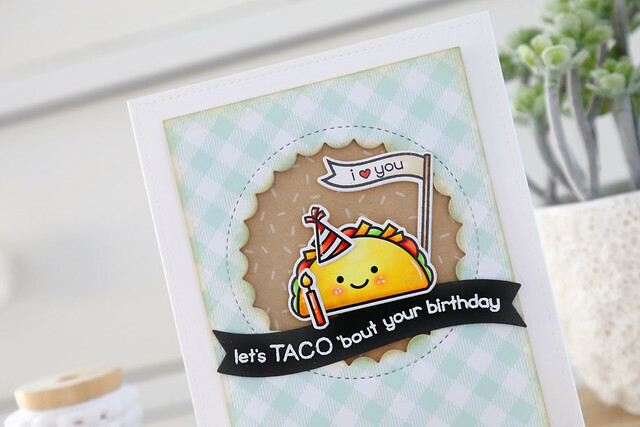 I never knew a taco could be so stinkin' cute! To finish off the card, I heat embossed the sentiments into one of the new Wavy Banners. Check out the Lawn Fawn blog this morning for more design team inspiration - click! Welcome to this month's Lawn Fawn inspiration week! 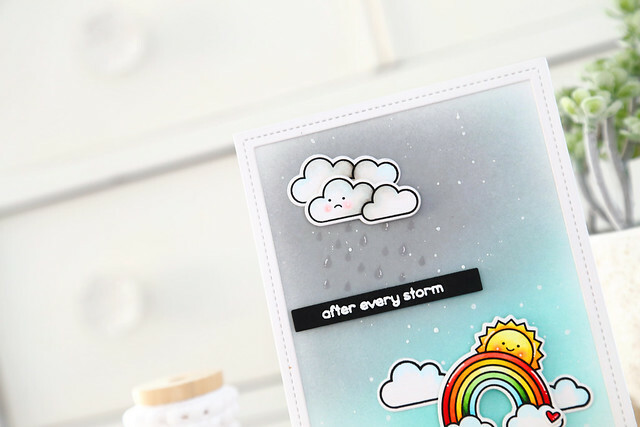 Today we're showing off Rain Or Shine Before 'n Afters. I did some ink blending to create 2 separate vignettes. Once I blended the greys and blues to my liking, I splatters on some white paint before stamping the cluster of stormy raindrops. To the clouds, I added a bit of grey shading (copic marker T0) and a sad face. I simply wiped the ink off the smile and stamped the eyes and then did the inverse so that I could stamp that smile upside down. I heat-embossed the sentiments onto black cardstock and snipped them out. 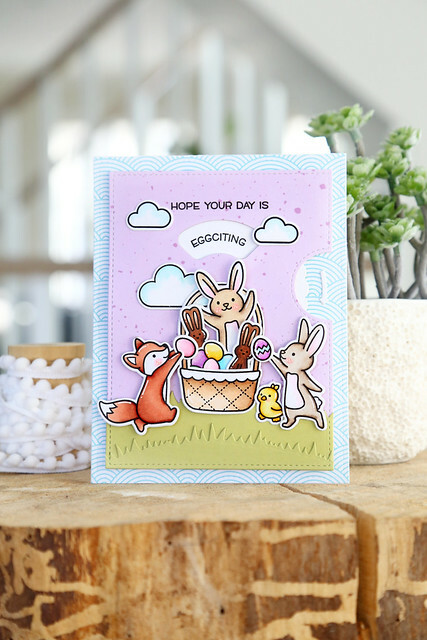 Lawn Fawn has something fun going on: A light-up card making kit, in collaboration with Chibitronics! 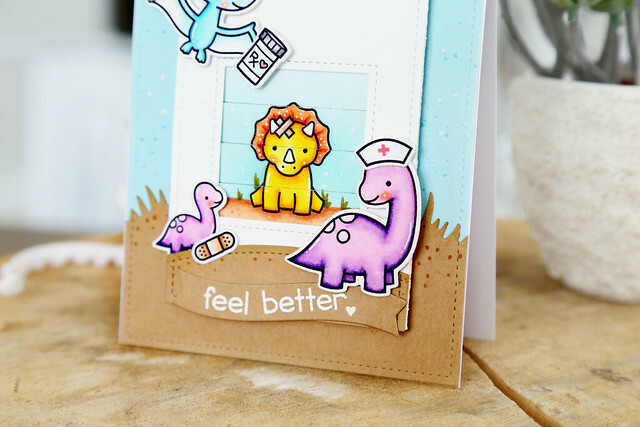 The kit comes with an exclusive stamp set, matching dies, and everything you need to charge them up! You even get a template and a set of step-by-step instructions. 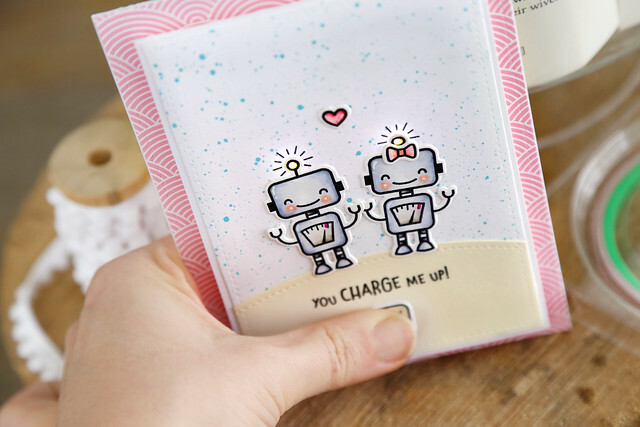 With this kit, you'll be able to make 2 light-up cards, and a ton more using the sweet robot stamp set. I kept my card embarrassingly simple, since I was a little intimidated by the light-up aspect! It turns out, however, that it's all pretty simple! I create a robot couple that gets all charged up whenever they're together. awwww! I hope you like it! 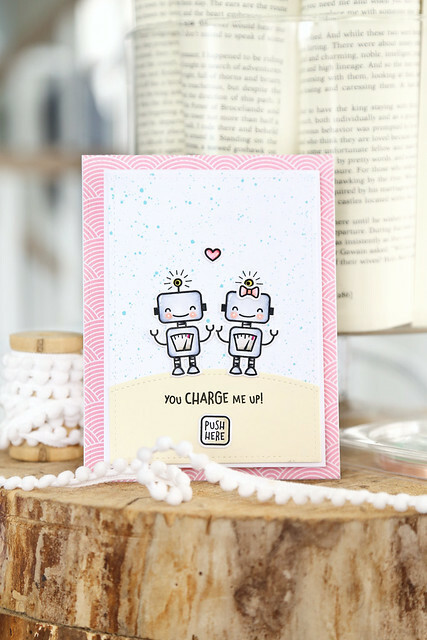 There are more charged-up creations on the Lawn Fawn blog this morning, and for the next few days too - click! 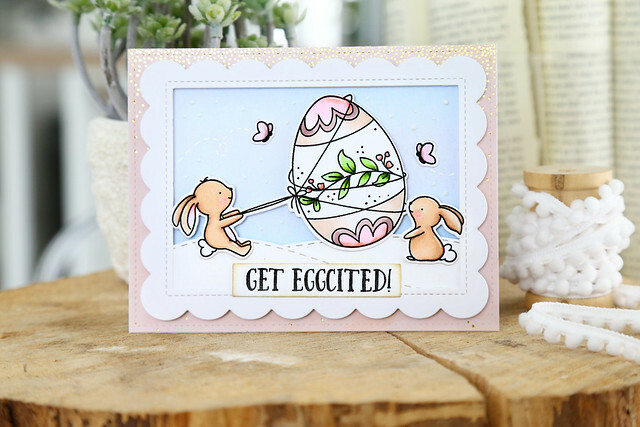 The sentiment shows off Celebration Scripty Sentiments, and I've paired it with stamps from Some Bunny and Easter Party. I still love those kids in costume images so much! Everything mixes and matches so well, it's what I love so much about working with Lawn Fawn products! 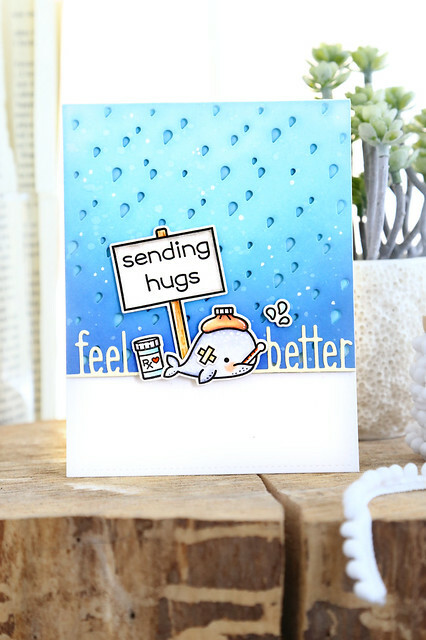 This card was on the LF blog yesterday (click HERE to see that whole post!) 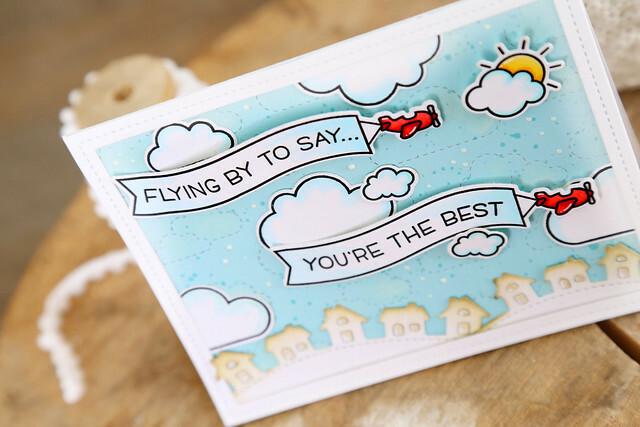 It shows off Simply Celebrate Spring with those flying airplanes, with a duo of Wavy Sayings fitted into their flying banners. I stamped out different clouds, and set them on top of a Stitched Cloud Backdrop. The Little Town Border below finished off the card. For my final card in this catch-up game, I have this soft and pretty number. 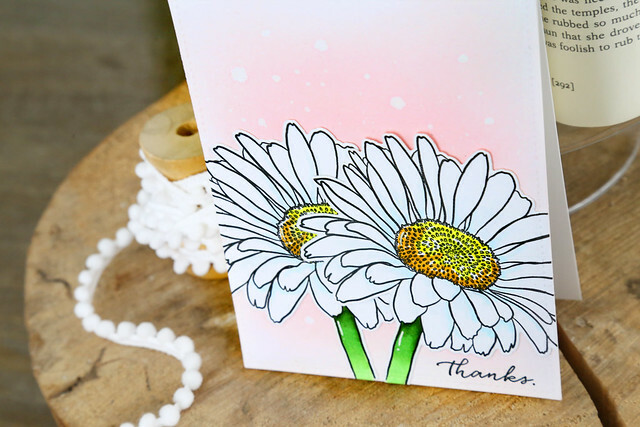 You can see the card on the Lawn Fawn blog here (click!) It features the Stitched Flower Frame. I cut it out of Spiffy Speckles paper, and added shading with a soft pink copic marker. I used the same marker to add soft pink cheeks. I cut the Fancy Lattice Backdrop twice, and layered them together for something fancy in the background. I hope you like everything! Thanks for stopping by! Now, onto today's project! 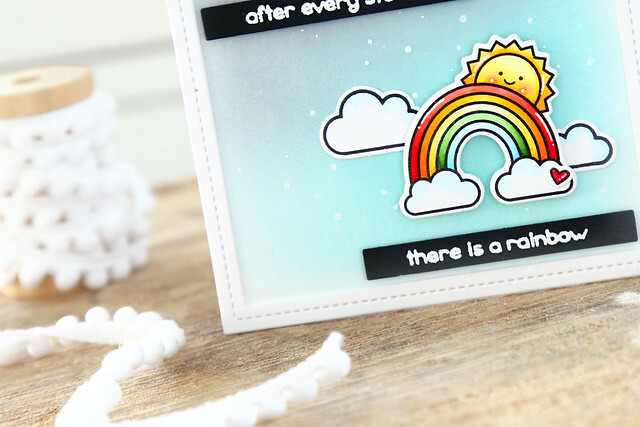 We're showing off add-on dies to the previously released Shadow Box Card die set. I loved making these little shadow boxes! They are EASY, and so cute. I used the Park Add-On dies for the aperture and the trees. I flipped the little half-circle upside down, because I wanted the soft, curved opening. I did a double-row of trees, so it looks all forest-y in there, and cut out 3 different colors of Spiffy Speckles paper: the pink ground on the outside of the box, the leafy tree tops, and the blue speckled sky for the back. 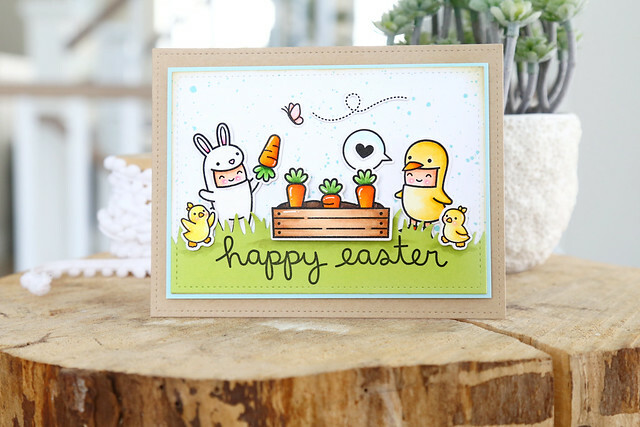 The stamped critters are from a few sets: Eggtra Amazing Easter, Rub A Dub Dub, and Butterfly Kisses. And speaking of butterflies, you only see the pair of them when you peer in from the top. It's a fun little surprise. I hope you like it! Check out all of the amazing shadow-box projects on the LF blog this morning - click! I started out by stamping the main bunny-and-egg image from Eggciting 2 times. I kept one intact, but cut the egg away from the bunny for the 2nd. It takes the 2 bunnies to haul this giant egg! I paper-pieced the egg-wrapper for a different look, stamping the image onto floral patterned paper, trimming out that section, and over-laying it onto the die-cut egg. 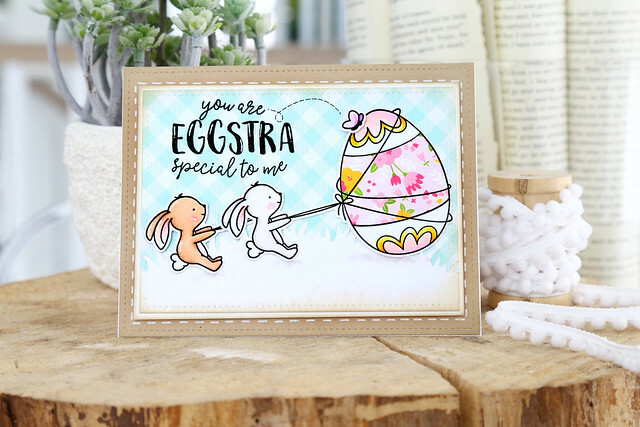 The sentiment was borrowed from an older set that I illustrated, Eggstra Special. That egg is definitely a little extra! For one final touch, I brought in the butterfly and dotted trail line from All The Bunnies. I love how it connects the sentiment to the large egg. The Neat and Tangled new release has already been teased to you in full (we're doing a smaller release this month!) and all of the new product will be available for sale tomorrow morning. In the meantime, the design team is hosting a bonus day of inspiration! We're showing off more projects using our new goodies. 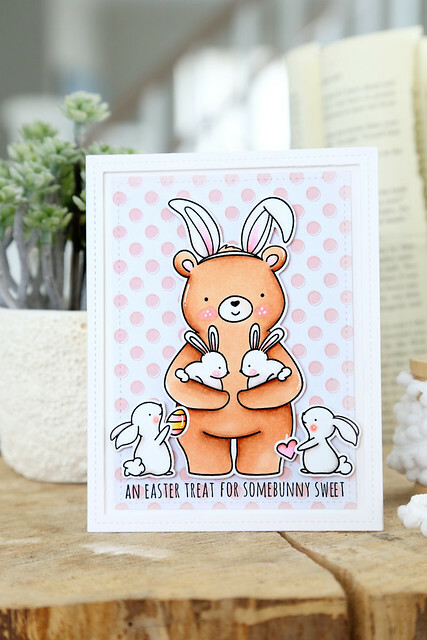 I placed him onto a sheet of pink polka dot patterned paper, and flanked him with a bunny on either side. The sentiment is from another new set this month, Eggciting. I love the size of the bear, and how he fills up the card-front! I hope you like it! Be sure to check out what the rest of the team crafted for today on the Neat and Tangled blog - click! Welcome to the third day of this month's Neat and Tangled release week. We will tease you with new products all week long and then they will be available for purchase on Friday morning in the store. I could have just stuffed and stitched a little llama, but I decided to try something a little more... involved. I'm so glad I did because it is just so cute! I made a llama box! 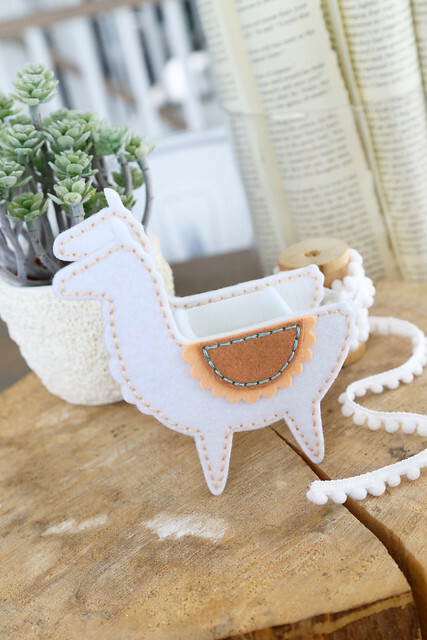 It's the perfect size for keeping on your desk and filling with little stamped die-cuts, or on your dresser to hold your rings. I gave it to my daughter and she filled it some plastic jewelry and it's adorable. I started out by cutting 4 of the main llama shapes out of felt, and another 2 out of very sturdy card-stock. So sturdy, it's almost cardboard. 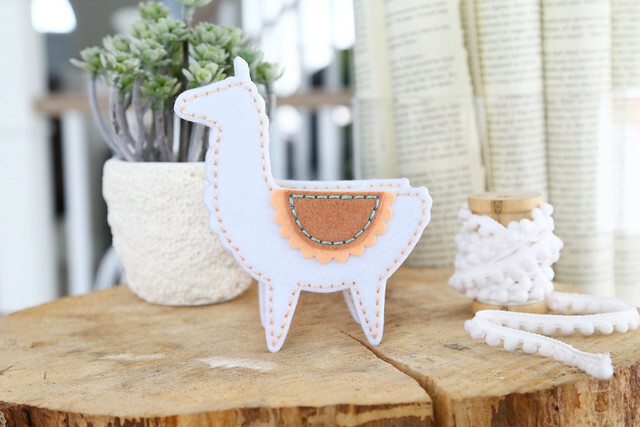 I then stitched 1 llama to each piece of cardboard/cardstock, and just so you don't see all of the thread-work, I glued on the remaining llama shapes to the back of each. You don't necessarily have to stitch anything on those layers, but I did so that it would look more polished. I just ran the thread through, but didn't stitch those layers to anything. Does that make sense? 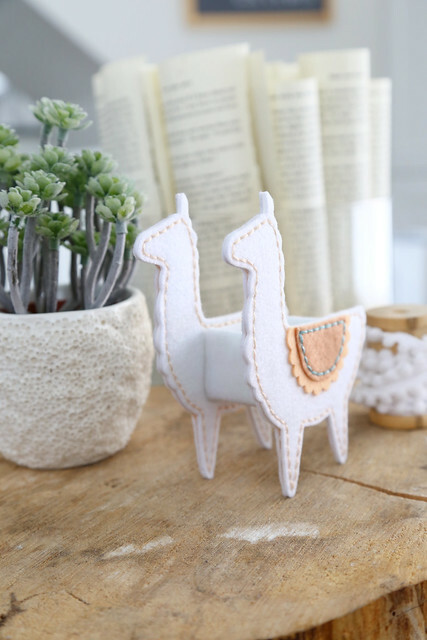 So each llama is comprised of a felt llama, a cardstock llama, and another felt llama. Next. I cut myself a box out of that same heavy cardstock, and adhered it between the 2 llamas. You could stop right there, but I opted to cover the cardstock box in white felt. I hope you like it! Be sure to leave me a comment before you leave - Danielle will choose a winning comment from among the design team's blog posts this week. You could win a $25 gift card to the NT store. 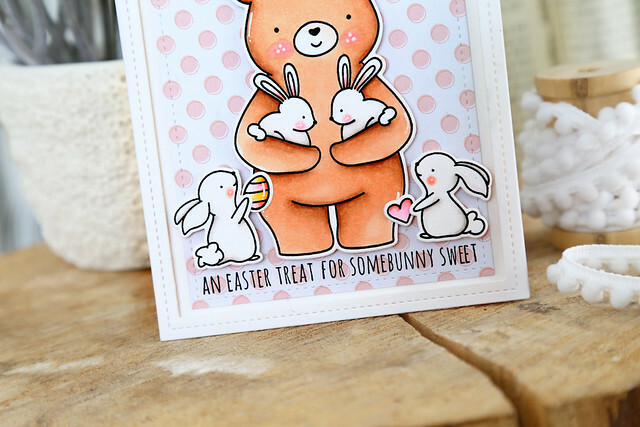 Now hop on over to the NT blog to see what the rest of the team created using this set - click! Welcome to the second day of this month's Neat and Tangled release week. We will tease you with new products all week long and then they will be available for purchase on Friday morning in the store. I love that big bear with his bunny ears! He's got me completely fooled. ha! 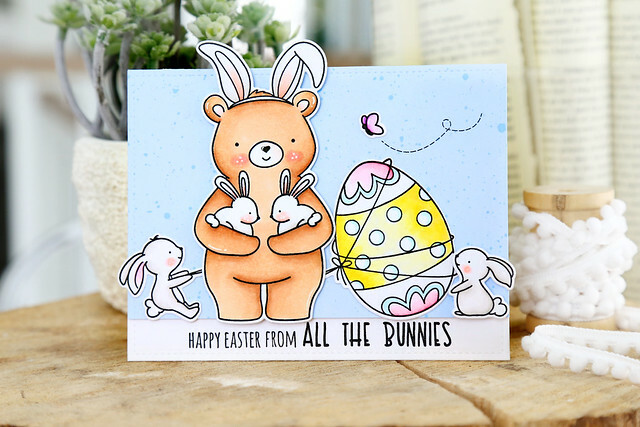 I really wanted the images to fill up the entire card-front, so I brought in the huge egg and bunny from yesterday's set, Eggciting, and cut the image so that it looks like the string is really long, in back of the bear. I couldn't help but add another bunny to round out the right side of the card, and added a butterfly as well. Welcome to the first day of this month's Neat and Tangled release week. We will tease you with new products all week long and then they will be available for purchase on Friday morning in the store. The bunny from Eggciting got more egg than he bargained for! The other bunny and butterflies are from a set you'll see more of tomorrow. I started out with a dusty rose colored patterned paper that has gold flecks covering the top (and before you ask, I have no idea where this came from!) and it set the tone for my pretty and pastel card. I colored the bunnies in a soft brown using copic markers (E41, E42 and E44) and then added a floral detail to the egg wrapper. I used the sprig image from Magical Day, and added some dots with a black pen. I love how this looks! When illustrating the egg, I purposefully left the egg wrapper plain so that you could add your own creativity to it. There is a small open circle included in the set, to add polka dots to the wrapper, or you could even paper-piece it for a completely different look. I have a few days with nothing to post, so I think I will go back and share projects that I made at the beginning of the month that were never blogged yet. 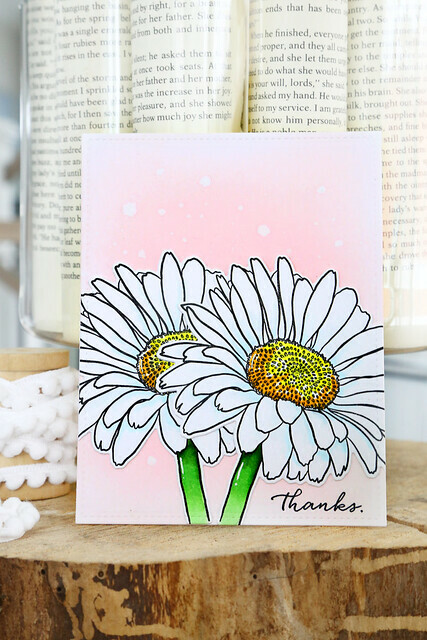 And this daisy image is so perfect for a quick and easy card. I am the world's slowest colorer (it's been documented) but this card came together in under 30 minutes. Because I only really had to color the stems and the middle of the flowers, I got the drama from the large floral without the coloring-time-commitment. In case you'd like to know, I used copic markers - Y02, Y11, and Y17 for the yellow centers. I started with a card base, onto which I did a little ink blending with Spun Sugar Distress Oxide Ink. Before the ink could dry, I flecked water droplets onto the entire think, for that dreamy bokeh effect. 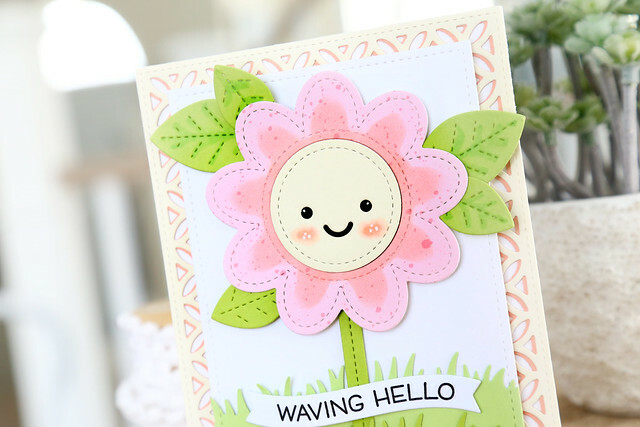 Next, I layered on the flowers, and stamped the greeting in the lower right hand corner to finish things off. Welcome to Lawn Fawn's February inspiration week! We're showing off products from the spring collection - all of which will be available for purchase tomorrow! Are you excited?? I did some ink blending using Spun Sugar distress oxide ink. I started blending in the middle, and feathered it out to give it a dreamy quality. I stamped the sentiment into a Bannertastic flag, and added some of the green leaves around the banner so that it all tied together better. 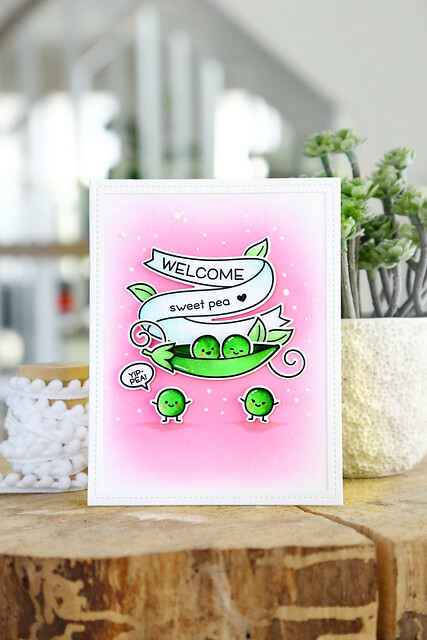 I added some darker pink grounding beneath the feet of the 2 pea "parents" and nestled the "big sister" into the pod with her newborn baby sister. To add extra interest, I used a white gel pen to add white dots for that bokeh look. 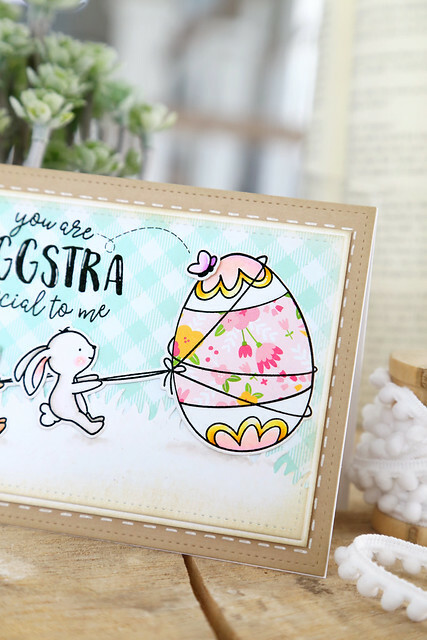 I used images from Butterfly Kisses and Eggstra Amazing Easter to create my scene. I love how all of the new patterned papers look together! I cut a tiny slit between the fox's paws so that he could properly hold his easter egg. I love his pose - it really looks like he's racing to fill that basket! 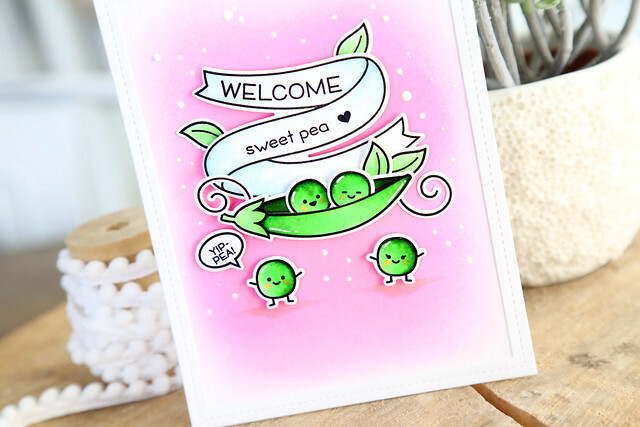 If you want to see how to create this card, Kelly featured it in her video yesterday - click!